Regional Connector Constructors (RCC) will be implementing a full closure of 6th St. between Flower St and Hope St, and the southbound I-110 off-ramp, with one lane open on 6th St between Figueroa and Flower St weekdays. The 24/7 closure will be in place from Saturday, June 3, through November 18, 2017. A full closure of 6th St between Flower St and Figueroa St will be in place weekends (except holidays) from 9 pm, Friday to 5 am, Monday, through November 18, 2017. Nighttime activities: excavation, relocation and protection of utilities. Get the latest project updates delivered straight to your inbox. Sign up to receive our newsletter. Eastbound Lines 16, 17, 18, 316 & 720 buses will operate via Wilshire Bl between Valencia and Hope St and return to regular route at 6th St. Stops will be located on Wilshire Bl at Witmer St, Lucas Av and St. Paul Av. Return service and stops will remain unchanged. 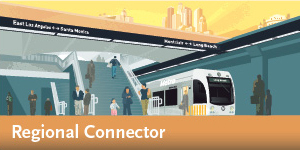 Westbound Line 460 and Northbound Lines 442, 910 & 950 will operate via Hope St between Olympic Bl and 6th St. Stops will be located on eastbound Olympic Bl at Figueroa St and on northbound Hope St at Wilshire Bl, and then return to regular route at 6th St. Return service and stops remain unchanged. Visit the metro.net Alerts + Advisories page for more information. Local access will be maintained. Crosswalks on the intersection of 6th St. and Flower St. will be modified with at least three crosswalks to remain open. Flaggers will be onsite to facilitate access. Southbound I-110 6th St. off-ramp will be detoured to 4th St. off-ramp, to Grand Ave. then back on to 6th St.
Traffic from northbound I-110 off-ramp onto eastbound 6th St. will be reduced to one lane between Figueroa St. and Flower St. Use alternate route via I-110 9th St. off-ramp. Eastbound 6th St. thru traffic will be detoured to southbound Bixel St. to eastbound 7th St. to Olive St. back to 6th St.
AON Center, Pegasus Garage, and The Standard Hotel (drop- off) access will be maintained on 6th St. from Hope St. This work will be coordinated with other activities in the corridor.